Compliment your jeans for weekend wear, change up casual Friday, or make date night a little more special; whether you are just starting a custom collection or if you have been partnering with us for decades, a bespoke Geoffrey Lewis sport coat is a versatile addition to any wardrobe. In addition to using the same detailed measurements mentioned in the suits section to ensure the perfect fit, we have a wide array of available design options to personalize your sport coat. Distinguish yourself from the crowd by including a colorful lining, contrasting colored buttons, colored buttonhole threading, or a vibrant color felt under the collar. Swap out brass buttons for pearl to bring life into your new blazer. Change the fabric to a textural navy hopsack to stand out. Geoffrey Lewis carries a large selection of sport coat materials from all the major fabric mills from around the world. 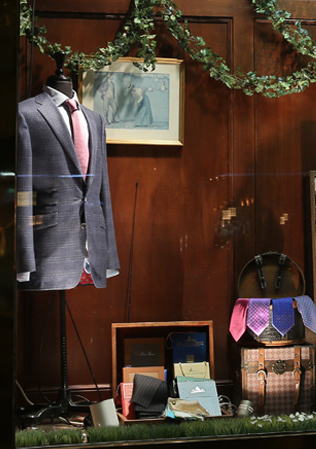 Visit our store to see samples of tweed, herringbone, windowpane, and varying weight seasonal wools. Our custom sport coats start at $900. Prices vary based on fabric selection. To complete your outfit, check out our Trouser section.